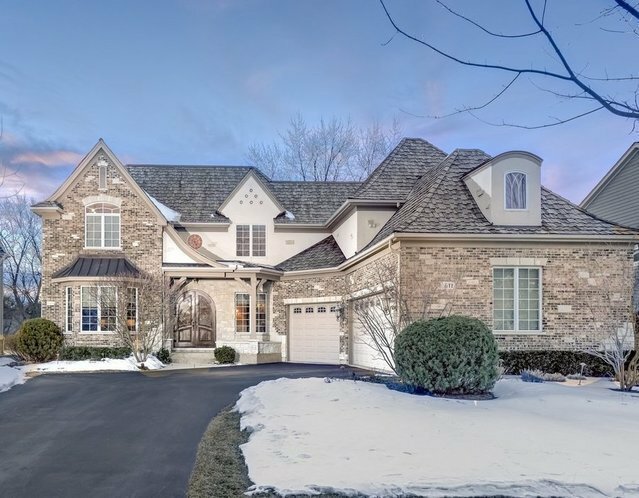 This impeccably appointed custom brick home is located within walking distance to quaint downtown Libertyville, shopping, dining, schools and Metra. Two story foyer opens to a gorgeous library with fireplace, large formal dining and living rooms and great room, opening to the spacious kitchen. The gourmet cooking center has granite, large island with prep sink, commercial Wolf, Sub-Zero and Bosch appliances. Luxurious finishes include, natural stone, marble, travertine, wide-plank hardwood floors, box beam ceilings, custom wainscoting and gorgeous Brazilian Cherry. Mudroom has dog wash, laundry center and private study space. A sweeping staircase leads to three ensuite bedrooms and a fabulous master suite with sitting room, dressing room, and spa bath rivaling five star hotels. Lower level has fifth bedroom, full bath, second kitchen, family, exercise, and hobby rooms. Professionally landscaped yard with stone patio, outdoor kitchen and fire pit. Three car garage has room for all the toys.